Rent increases and housing affordability have become a hot political issue in Seattle. Photo by the author. On Tuesday afternoon the Seattle Times’ Danny Westneat broke the news (in an inflammatory manner) that Mayor Ed Murray’s committee on housing may recommend making changes to the city’s single-family zoning. If the idea lands on the committee’s final set of recommendations, and makes it through the political wringer of City Council politics, it has the potential to improve many of the city’s neighborhoods. And if done well, it could greatly reduce the housing equity crisis and stabilize skyrocketing rents. The Housing Affordability and Livability Advisory (HALA) Committee first convened in November 2014. This was shortly after the U.S. Census Bureau reported that among the 50 largest U.S. cities Seattle’s rent increases were the highest (11 percent) between 2010 and 2013, and Seattle was the fastest growing U.S. city between 2012 and 2013. The 28 member HALA committee is made up of affordable housing advocates, architects, developers and builders, and many others who have an interest in Seattle’s housing market. They have been tasked with recommending a set of policies and actions to address housing displacement and increasing rents by the end of this year. The committee’s task is daunting. Seattle is planning for some 120,000 new residents over the next 20 years and is building out a new light rail network, which is sure to increase housing prices even further. Economic cycles will certainly bring ups and downs, but in the meantime a construction boon is bringing in thousands of new office jobs and fueling increasing rents in the city’s most populous and popular neighborhoods. Debate is raging over the consequences of this rapid growth, especially with the strain on local transportation systems and the appearance of ubiquitous six-story apartment buildings in many neighborhoods. Typical “5 over 1” apartments over retail that are appearing in Seattle’s mixed-use neighborhoods. Photo by the author. Urban growth is good for the city and its residents. More city dwellers means (ideally) greater diversity, a more vibrant economy and social scene, and greater environmental benefits as people live in smaller homes and drive less. But the rapid surge in population that Seattle is experiencing now, and its lack of concurrent infrastructure growth, is creating many concerns. Housing prices are one of the most obvious signs of strain as renters are pushed out of their homes and forced to move farther from their jobs or out of the city entirely. Development in Seattle’s urban centers and urban villages have no parking requirements, which lowers the cost of housing construction. I’ve previously written on this topic. Recently passed microhousing legislation aims to create more options for people who can’t afford market rate studio or 1-bedroom apartments and are comfortable with living small. 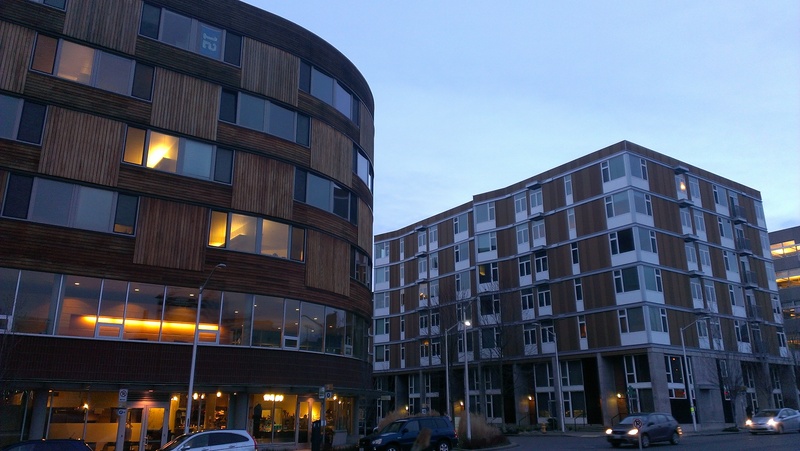 The city’s current housing levy provides public housing to low-income, senior, and formerly homeless people; there are calls to increase the levy after it expires next year. Councilmember Mike O’Brien has proposed a “linkage fee” that will help fund additional affordable housing through fees on new development. Owen Pickford at The Urbanist argues that linkage fees would be passed on to landowners, not renters. 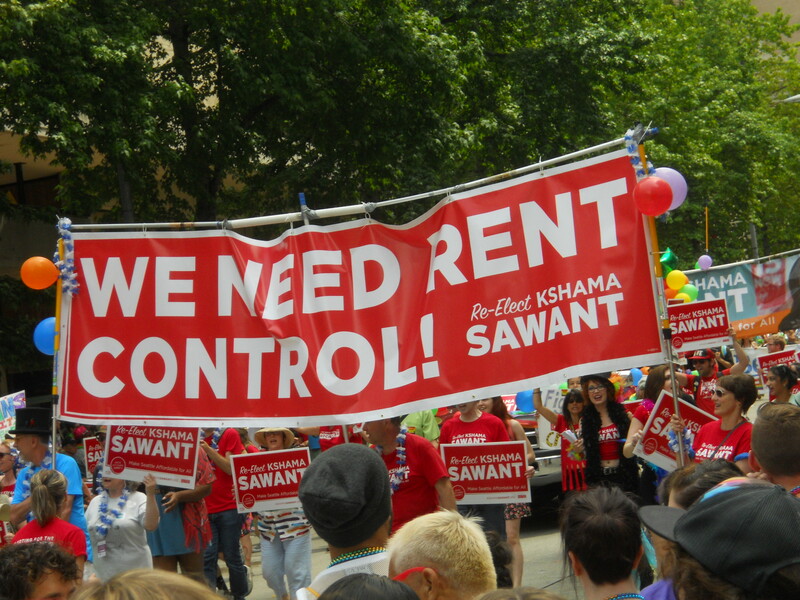 Councilmember Kshama Sawant is vigorously advocating for some form of rent control (which could include capping total rents or annual rent increases), though state law forbids it. Local advocate Ben Schiendelman wants to remove height limits to increase housing supply to meet demand, potentially lowering prices. City Council candidate Alon Bassok is calling for inclusionary zoning, which would require residential developers to include affordable housing units in new buildings. On the other end of the spectrum, some groups are clamoring for moratoriums on new development. Outgoing Councilmember Tom Rasmussen, in particular, is an anti-growth voice with his proposal for neighborhood conversation districts and proposed amendments to lowrise zoning that would limit the size of new apartment buildings. He also said recent construction represents Soviet-style apartment blocs. The exclusivity of Single Family Zones limits the type of housing available for sale or rent, limits the presence of smaller format housing and limits access for those with less income. Seattle’s zoning has roots in racial and class exclusion and remains among the largest obstacles to realizing the city’s goals for equity and affordability. In a city experiencing rapid growth and intense pressures on access to affordable housing, the historic level of Single Family zoning is no longer either realistic or sustainable. HALA recommends allowing more flexibility and variety of housing in Single Family zones to increase the economic and demographic diversity of those who are able to live in these family oriented neighborhoods. In fact, HALA recommends we abandon the term “single family zone” and refer to such areas as low-density residential zones. There are a number of ways these new “low-density residential zones” can be more equitable and contribute to citywide growth. One is to make the proposal less dramatic, and by doing so attracting less resistance, by first limiting the changes to the areas around urban villages and within walking distance of commercial services and transit lines. These areas tend to already have a mix of low density housing. Another step would be to allow corner stores and small businesses to locate in these areas. Citywide, the document suggests reducing regulatory burdens for accessory dwelling units (ADUs, separate living spaces in houses like basements, attics, or new additions) and detached accessory dwelling units (DADUs, otherwise known as backyard cottages); a number of Seattle City Council candidates have voiced support for promoting these options. Specifically, the committee recommends removing parking requirements, removing ownership requirements, creating standard plans for DADUs, and allowing both an ADU and a DADU to be on a property. Left: example of townhomes with private parking in Ballard. Right: example of cottage housing in Green Lake/Roosevelt. Photos by the author. The committee also recommends allowing a mixture of other housing types throughout most of the city. Cottages, courtyard housing, duplexes, and triplexes are specifically called out. Presumably townhouses and rowhouses should also be part of the mix. The advantages of mixing housing types are many. To name a few, from an urban form standpoint they can fit in with single family homes through massing, setbacks, height, and materials perhaps better than taller apartment buildings can. But this issue is not only about neighborhood character, it’s also about the characters. 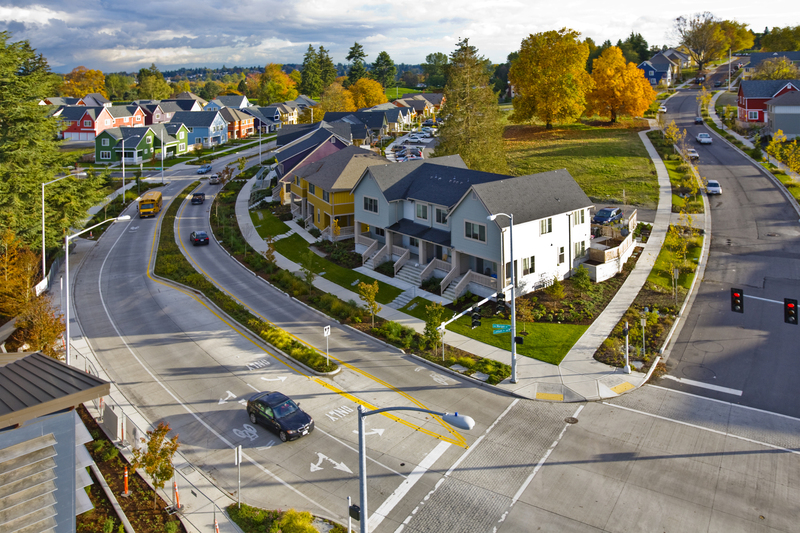 A variety of housing forms can provide a mixture of housing costs, allowing for mixed-income communities and a diverse population to enjoy the benefits of quiet neighborhoods. Further, increasing population densities in outlying neighborhoods can create incentives for businesses and local bus service to locate there, giving more people the option to leave the car at home. Requiring one off-street parking space for every single family home is an artifact of an earlier era and is not a necessary or effective requirement. The space occupied by an off-street garage or parking space could be used instead to accommodate space for housing, including an accessory dwelling unit. The most common parking configuration – a driveway and curb cut accessing a garage from the street – occupies curb space that could be used to provide a parking space on the street. A 1:1 parking requirement eliminates exactly as many on-street spaces as it mandates off the street, causing no increase in parking supply, bisecting sidewalks with countless driveways, and gobbling buildable housing space for redundant (and expensive) parking. Therefore, the City should consider removing the parking requirement for single family homes. 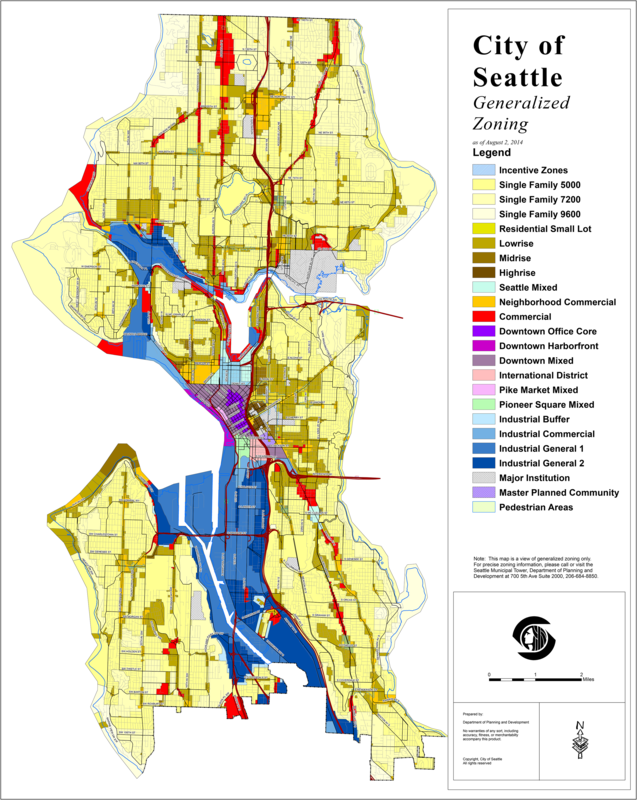 There is no legislative need for Seattle’s single family zones to absorb additional housing units. 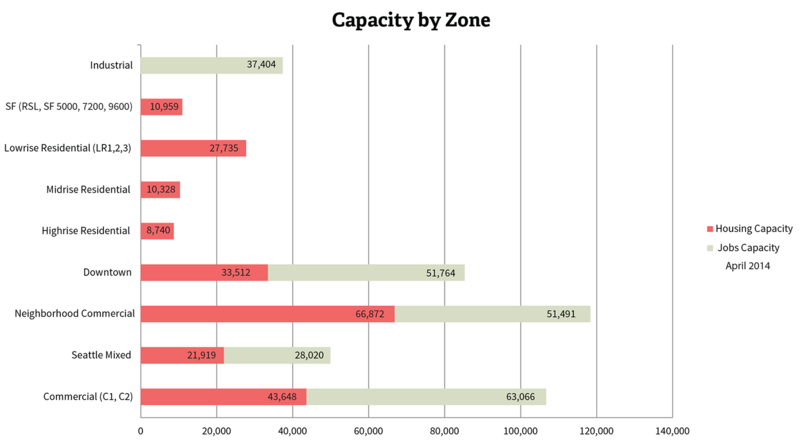 According to the city’s Development Capacity Report, updated for the Seattle 2035 Comprehensive Plan, all of the city’s non-industrial zones have an excess of zoned capacity for housing units. Indeed, even without changing single family zones, they have capacity for an additional 10,959 homes. This HALA committee idea is also not reflected in any of the four alternatives for growth allocation presented by Seattle 2035. All four of the alternatives consider variations of concentrating population and employment growth in urban villages, urban centers, and around transit hubs. Allocating any substantial amount of new growth to single family areas may require a fresh analysis of environmental impact and the need for infrastructure. Still, the draft recommendation is a forward-looking step. Along with its many other policy proposals, the HALA committee has agreed that housing affordability is a problem and there are known solutions. If this idea makes it through the inevitable pushback of single family homeowners and the scrutiny of the City Council, it could help ensure more of Seattle’s many neighborhoods are responsible for absorbing new growth and greeting new neighbors. This entry was posted in Density, Housing, Land Use, Policy, Residential and tagged accessory dwelling units, ADU, backyard cottages, capacity, changes, committee, comprehensive plan, cottages, DADU, Danny Westneat, department of planning and development, diversity, Ed Murray, HALA, Housing Affordability and Livability Agenda, income, mayor, neighborhoods, proposal, recommendations, rowhomes, Seattle, Seattle 2035, single family, townhomes, variety, zoning. Bookmark the permalink.